Smartphone use is spreading, maybe to such an extent that they now surpass PCs and regular mobile phones as a convenient online communications terminal. 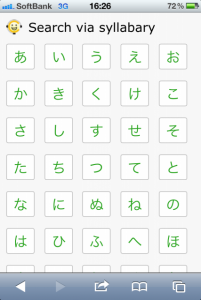 For language-learning too, you’ll find lots of useful applications or websites where the PC version’s contents can be viewed easily on a smartphone. 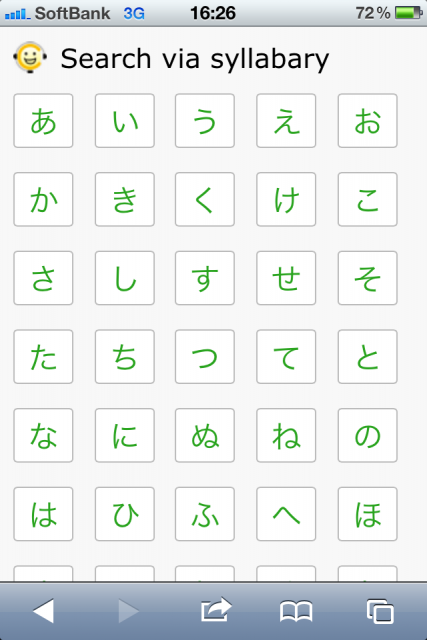 In this article we’ll take a look at the new smartphone version of NIHONGO de CARE-NAVI (Introduction article) and introduce some features unique to this smartphone edition. First, let’s look at how to use it. The navigation style and screen layout have been redesigned specifically, so it’s easy to view and smooth to use, even on the smartphone’s relatively small screen. 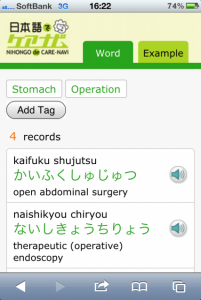 You can search for example sentences used in nursing and care situations. 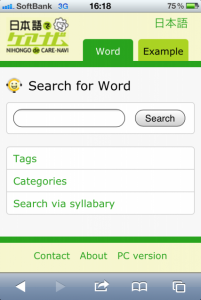 There are 4 search methods you can use when you want to look up a word or phrase. 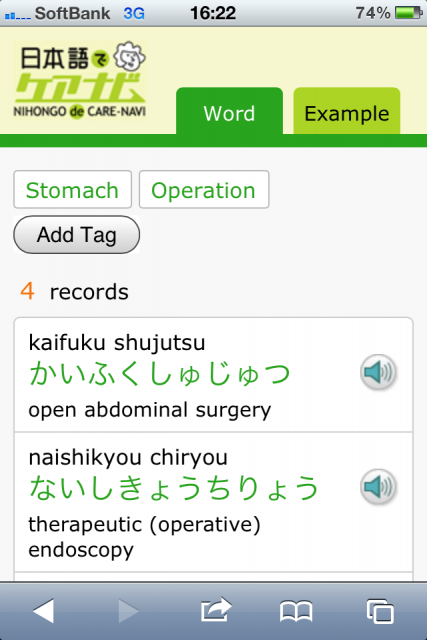 You can search by directly inputting a term, or you can choose to search using tags, categories or via Japanese syllabary. 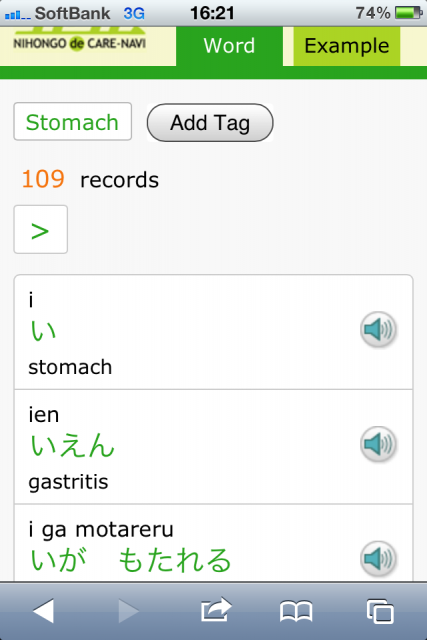 This option to search by Japanese syllabary is a special feature not included on the PC version of the website. 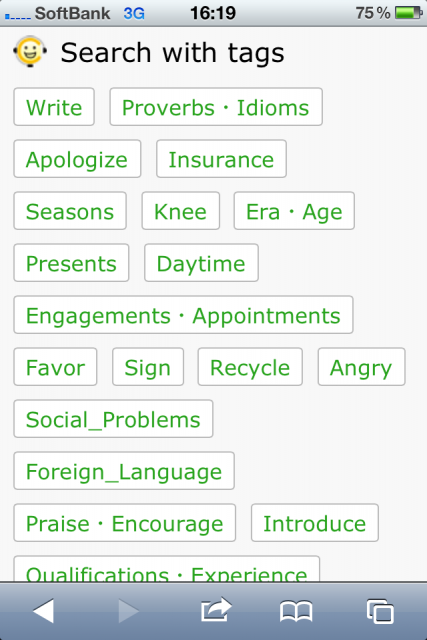 In the ‘Search with tags’ section, you can look up the word you’re searching for from a number of tags (keywords). 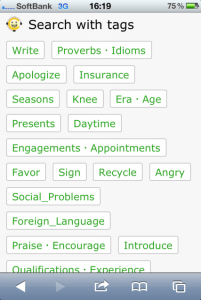 First, try selecting one tag related to the word you are looking for. To add another tag and further narrow down your search, tap the ‘Add Tag’ button and make your selection. A list of items that have those keywords in common will be shown. To see detailed information, tap on the words (written in green). 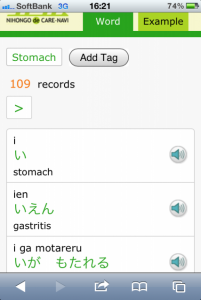 Several features, including an option to play audio, example sentences, illustrations and related words under the heading ‘Do you know these words?’ will be shown. In the Categories search, you can begin to narrow down your search by choosing from broad categories such as ‘Basic Care’, ‘At the workplace’ and ‘Medical Care’, then see a list of words related to different situations under these categories. Please make use of the option to Search via syllabary too, which acts as an index of all the items in the database. 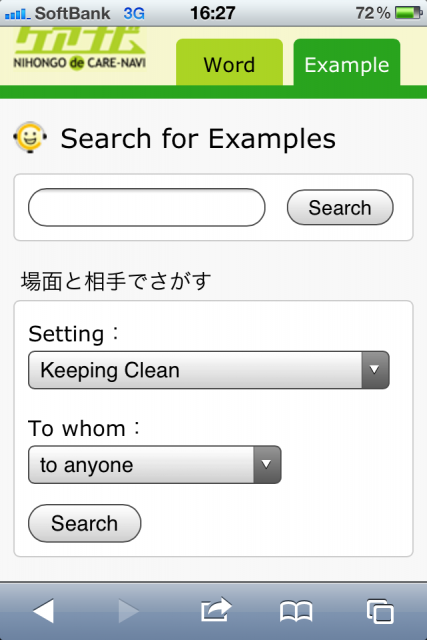 To search for example sentences where a particular word or phrase is used, you can use one of two methods. 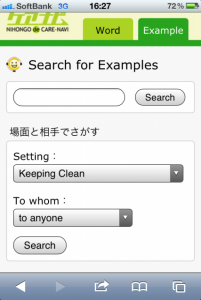 You can do a general search by specifying the setting and the person to whom a phrase would be said (e.g. a doctor/a patient etc. 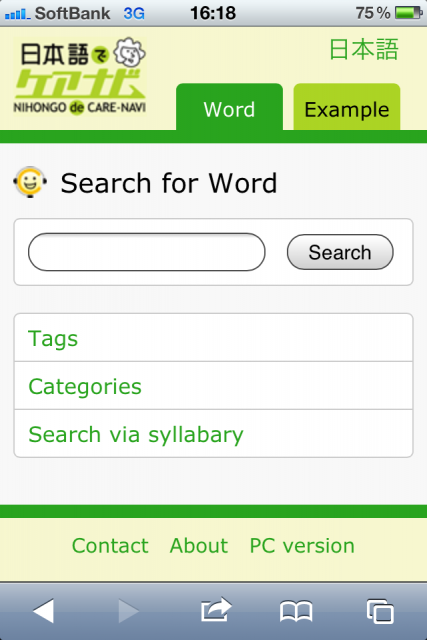 ), or you can simply enter a particular word or phrase and search for examples from there. Some features, like quizzes and info on Japanese counters, are not available on this smartphone version. Please see the PC website for those! The convenient thing about smartphones is that you can carry them around with you whenever and wherever. Even if you’re on the train or sitting on a park bench somewhere, if something pops into your head and you want to look it up, you can do so straight away. 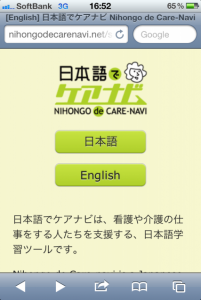 You can listen to audio on the CARE-NAVI site. 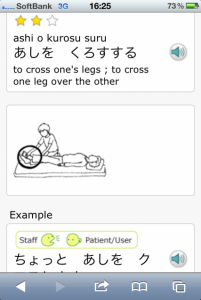 If you have the smartphone version handy you can play the audio then and there, so you can even have the person next to you hear the spoken Japanese too! 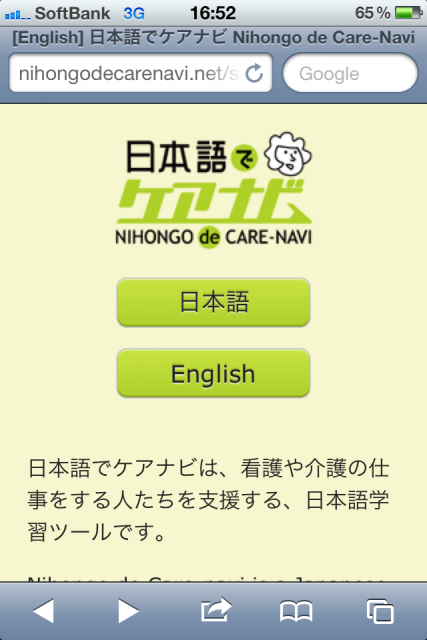 With the new smartphone version of NIHONGO de CARE-NAVI you can look things up on the spot, whenever you need to! 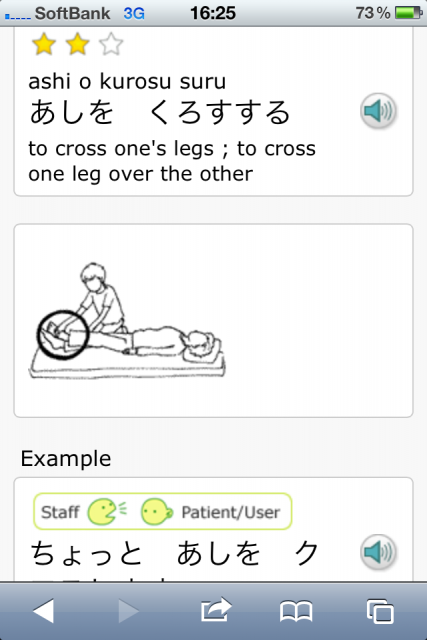 So, whether you’re a foreigner living in Japan, working in nursing or as a caregiver - or even if you’re a Japanese person heading overseas - by all means please make use of this handy tool! Well, that really is only possible on a smartphone!